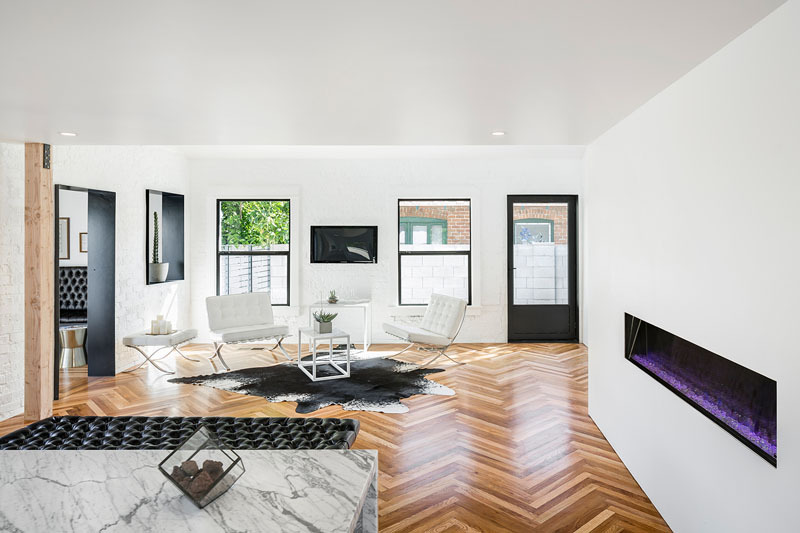 When you fall in love with an early to mid-20th-century house that’s got beautiful bones but could use some updating for your 21st century lifestyle, where do you even start? 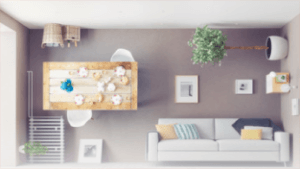 Budget constraints and DIY inclinations might mean you only restore the hardwood floors and swap out the appliances, but if you decide you want to take on a bigger project, there are all sorts of ways you can give the home a fresh new look without significantly altering its structure. 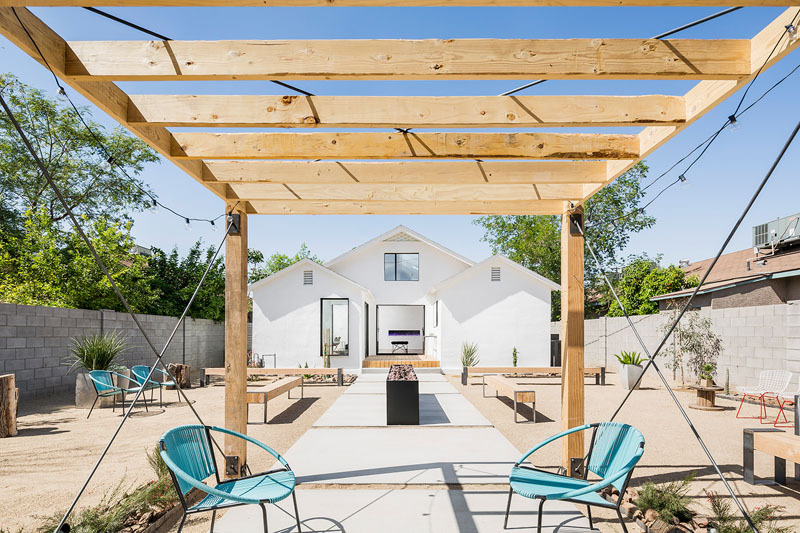 This renovation by Knob Modern Design is a perfect example, providing lots of inspiration for a complete inside-and-out transformation that preserves the historic character of a 1920s house in Phoenix, Arizona. Prior to its makeover, the house – originally built as a duplex – needed quite a bit of TLC. 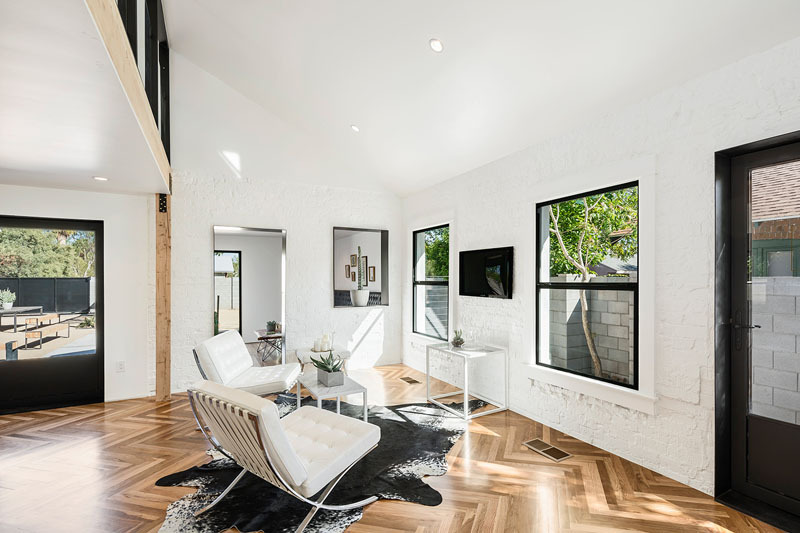 The designers partnered with investor Dana Martin to turn the modest home into an urban oasis with a private backyard built for parties and a crisp, welcoming interior seamlessly blending older architectural features like whitewashed brick with new finishes like herringbone wood floors. 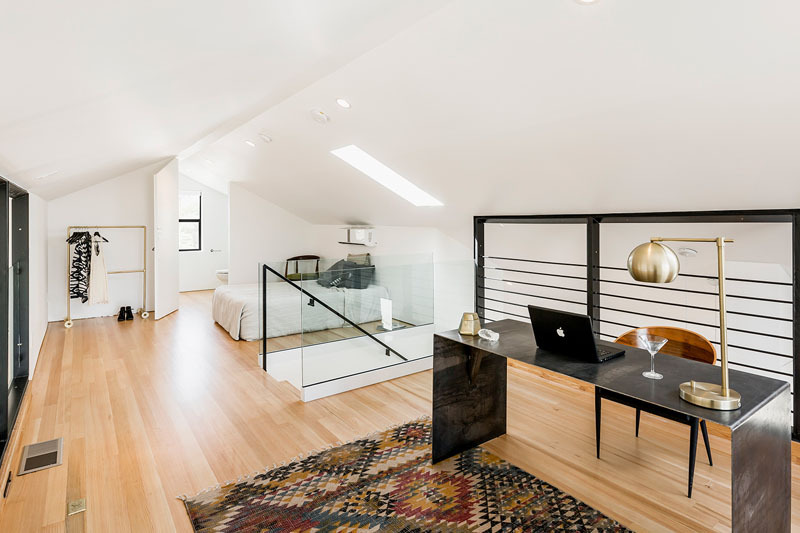 While most homes from that era tend to feel closed-up and dark, divided into small rooms, this space feels bright and airy, with a new open floor plan. That gorgeous herringbone flooring was salvaged from the original linear wood floors and relaid into this pattern. At the heart of the home is a divided kitchen that places a gas cooktop, wine storage, sink and bar within view of the living room for ease of entertaining; the food prep and cleanup area is tucked away through a doorway, with a pass-through window. 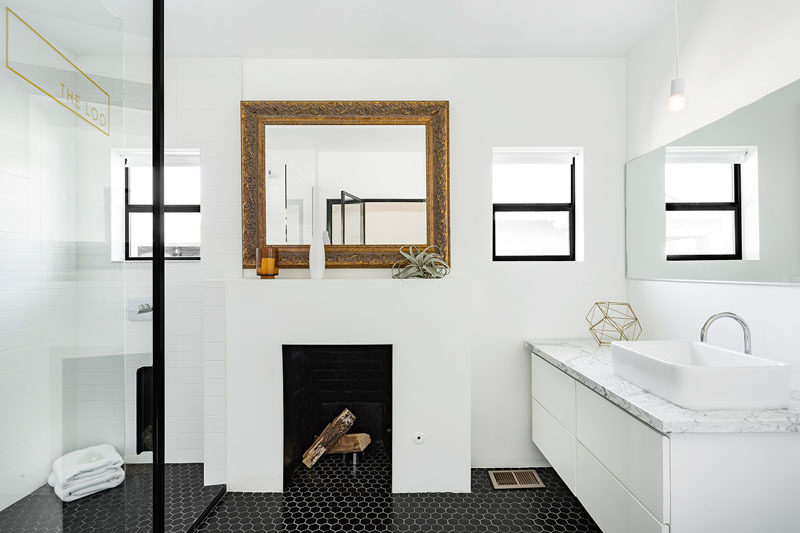 The kitchen island is tucked beneath slabs of white marble, a clean and minimalist visual choice that continues in each of the bathrooms, where small spaces seem to expand thanks to all that white paint, high-contrast color schemes and plenty of mirrors. 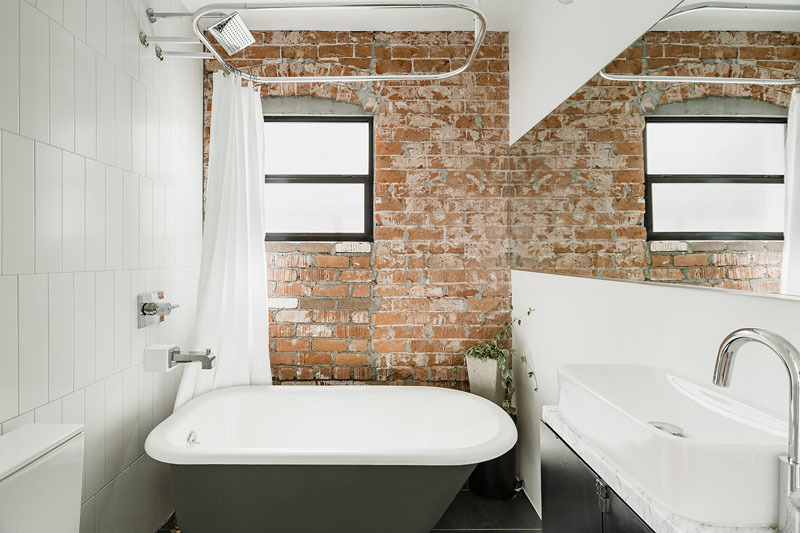 One bathroom boasts a clawfoot tub, while the other features a glass-walled shower and even a fireplace. Along one wall of the living room, built-in tufted leather benches provide plenty of seating and look out onto the patio through sliding glass doors. 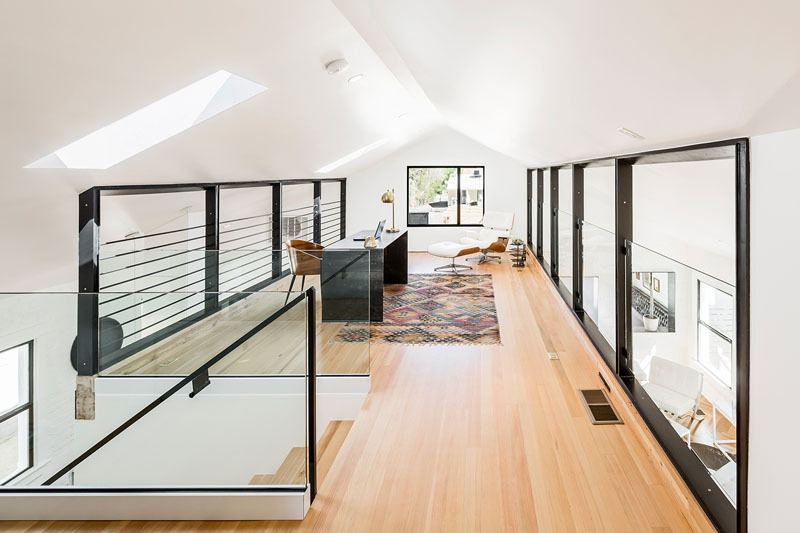 A floating black staircase leads up to the house’s most notable interior feature: a loft that runs the length of the house, open on two sides. On this second level, the stairwell is walled off with glass to maintain a continuous visual line from one end to the other. 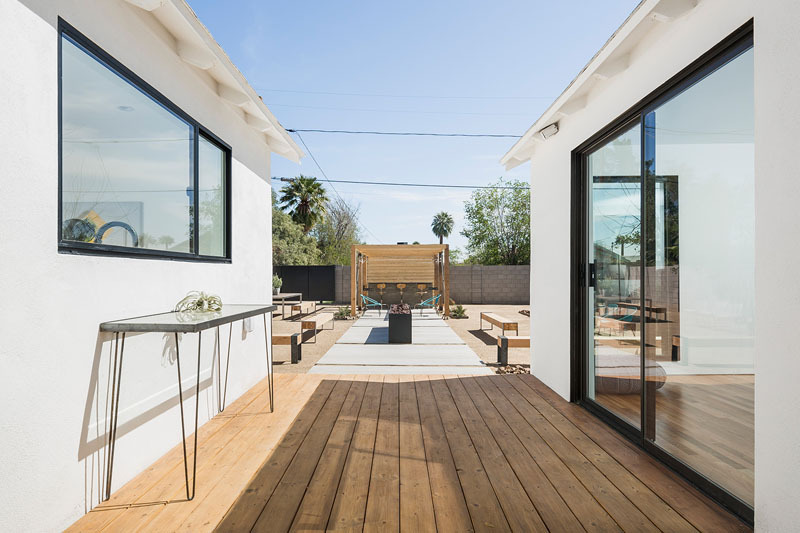 The backyard is a real gem, with walls high enough to provide complete privacy from neighbors and passersby so only the surrounding trees peek over. 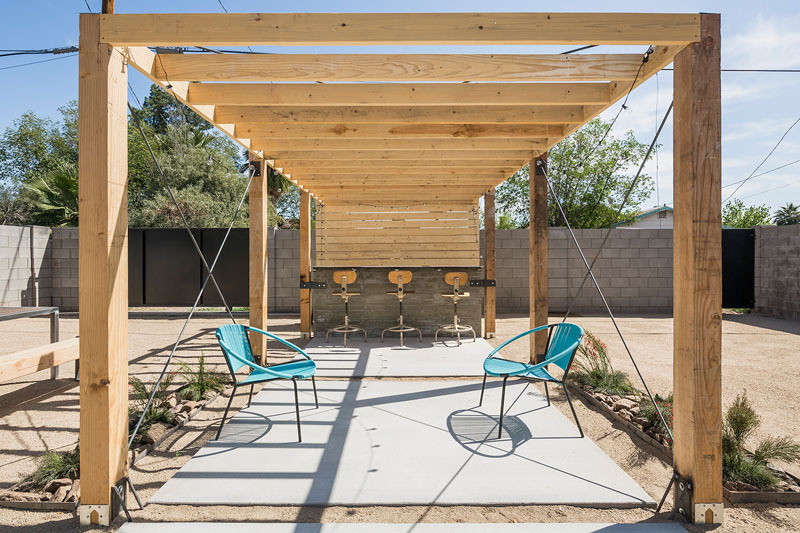 Landscaped for the arid Arizona climate, the yard offers lots of bench seating, a streamlined modern fire pit, a series of concrete patio surfaces and a pergola that could support textile shades in summer. From outside, the house has a sunny lightness reminiscent of traditional Greek style, but all of the ‘20s features still shine. 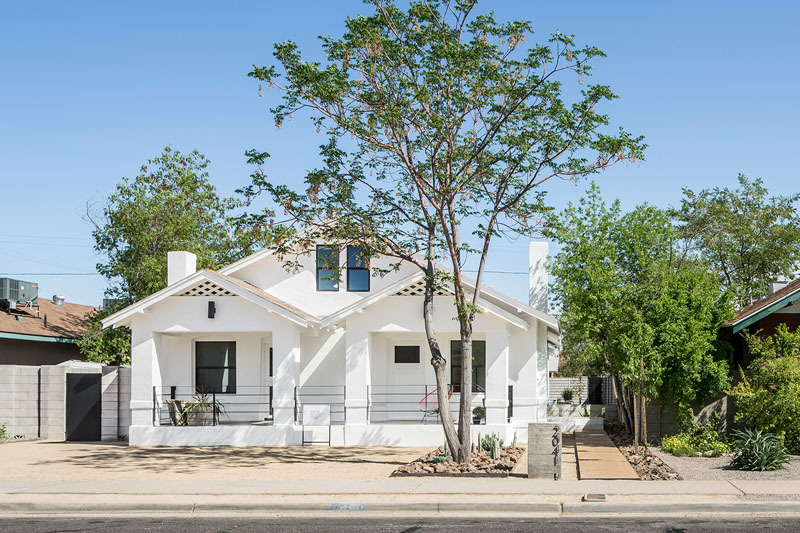 This home in the Coronado Historic District went up for sale in March, but if you weren’t the lucky buyer, you can still snag a few ideas from the renovation for your own projects.